Red Pepper Truffles for sale. Buy online at Zingerman's Mail Order. Gourmet Gifts. Food Gifts. 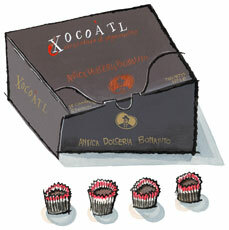 Bonajuto has been making chocolate in the baroque Sicilian town of Modica since 1880. By that time Gustav Lindt had perfected conching, the process that makes chocolate smooth. Nearly every European chocolate maker adopted it. Bonajuto didn’t. They continued to make unconched chocolate, the texture crunchy in comparison. Nowadays that texture has come somewhat back in fashion. A number of modern American chocolatiers, including Taza, make chocolate in this style. Here, you can experience it as it was and always has been. This gift box has bite sized truffles spiced with just a hint of red pepper, another typical addition to 19th century chocolate. An outstanding gift for a chocolate lover—or history buff.